Use printable coupon at any Banana Republic Factory Store in the U.S. and save 40% on your entire purchase (excludes clearance styles). Or, if you are a cardmember you can also save on clearance styles when you use your Banana Republic card or any Gap Inc. credit card. To receive the offer use printable coupon which is available through Banana Republic emailing. Source of the information is Banana Republic. Offer expires today (07/31/2016). 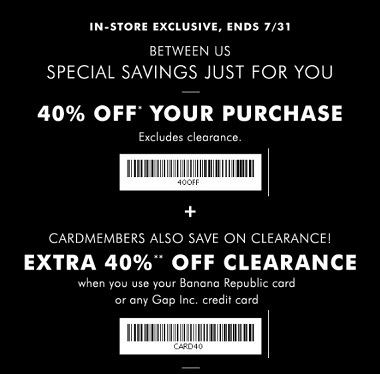 More details about the offer available at any U.S. Banana Republic Factory Store.